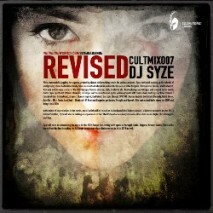 CULTMIX007 - Revised | Joomla! While successfully juggling her agency, promoting shows and providing vocals for various projects, Syze continued burning up the wheels of steel playing shows both domestically coast-to-coast and abroad in such exotic locales as Sofia, Bulgaria, Thessaloniki, Greece, and Bucharest, Romania and in every corner of the USA Georgia, Florida, Arizona, Utah, California etc. 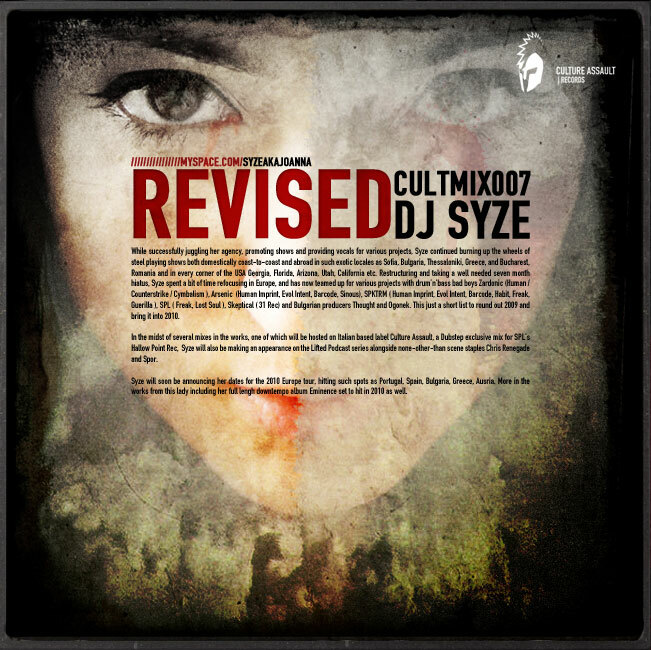 Restructuring and taking a well needed seven month hiatus, Syze spent a bit of time refocusing in Europe, and has now teamed up for various projects with drum’n’bass bad boys Zardonic (Human / Counterstrike / Cymbalism ), Arsenic (Human Imprint, Evol Intent, Barcode, Sinous), SPKTRM ( Human Imprint, Evol Intent, Barcode, Habit, Freak, Guerilla ), SPL ( Freak, Lost Soul ), Skeptical ( 31 Rec) and Bulgarian producers Thought and Ogonek. This just a short list to round out 2009 and bring it into 2010. In the midst of several mixes in the works, one of which will be hosted on Italian based label Culture Assault, a Dubstep exclusive mix for SPL's Hollow Point Rec, Syze will also be making an appearance on the Lifted Podcast series alongside none-other-than scene staples Chris Renegade and Spor. Syze will soon be announcing her dates for the 2010 Europe tour, hitting such spots as Portugal, Spain, Bulgaria, Greece, Ausria. More in the works from this lady including her full lengh downtempo album Eminence set to hit in 2010 as well.